I almost never fail to buy a Mrs.Fields cookie every time I do my weekly groceries. There is something "magnetic" about a cookie, more so a Mrs. Fields cookie, that I almost always find myself reaching out for my wallet to buy a cookie. 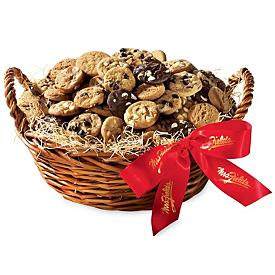 When the kids are all home, I sometimes buy mrs fields basket filled with those mouth-watering nibblers. My favorite is oatmeal cookie but I also have a tight affinity to choco chips. On occasions I settle for mini muffins. of course I prefer the traditional-sized muffins but when one is intent on eating not one or two or three more cookies on top of a muffin, a mini will do just fine. I want one, right now! oooh, cookie lover here too!